Casual elegance and comfort make this queen sleeper sofa the ideal addition to your living room or den. Its memory foam mattress allows you to quickly create a sleeping space to offer guests. 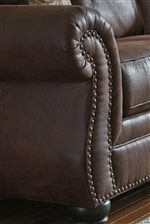 Rolled arms receive a transitional accent with nailhead trim. Plush cushioning in the three seat cushions with coil seating and back cushions with accent stitching provide support for relaxing. Two accent pillows with feather inserts in a complementary fabric complete the sofa. The Breville Faux Leather Queen Sofa Sleeper with Rolled Arms and Nailhead Trim by Benchcraft at Michael's Furniture Warehouse in the San Fernando & Los Angeles area. Product availability may vary. Contact us for the most current availability on this product. The Breville collection is a great option if you are looking for Transitional furniture in the San Fernando & Los Angeles area. Browse other items in the Breville collection from Michael's Furniture Warehouse in the San Fernando & Los Angeles area.